The arch of a person’s foot is the main supporting structure of the body. It is composed of bones that are connected by ligaments. 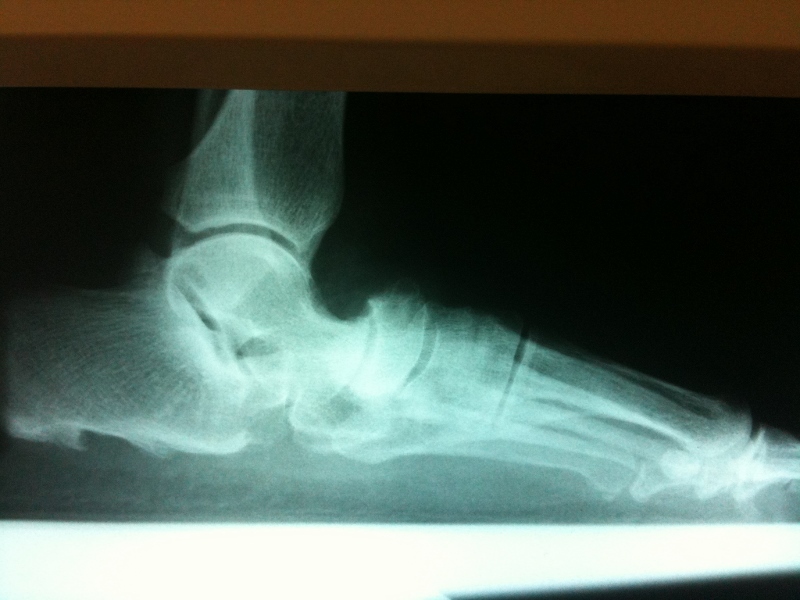 If the ligaments are strong, the integrity of the arch remains intact. 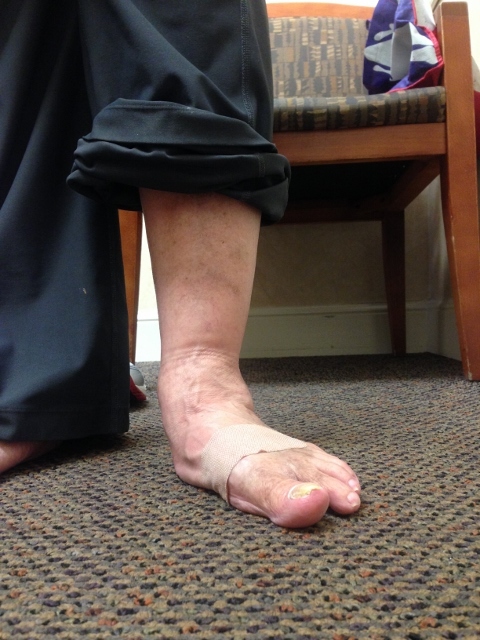 Ligaments that are loose or weak allow the arch to flatten. When this occurs, muscles try ineffectively to hold up the arch. Pain in the foot, legs, ankle and back often develops. 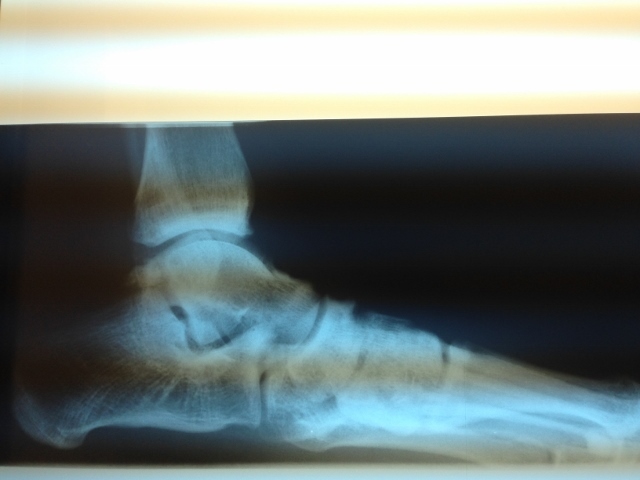 Loose or weak ligaments of the arch are the most common reason. 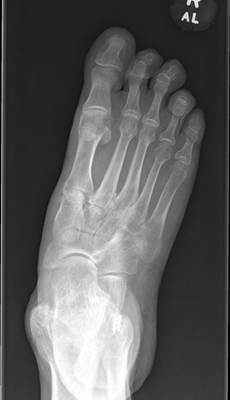 Bone abnormalities that may be hereditary or acquired from injury (tarsal coalitions or fractures). 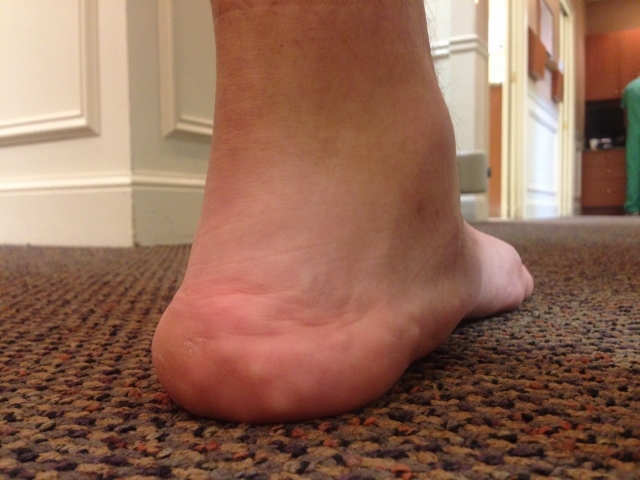 Trauma to tendons and ligaments on the inside of the arch and ankle may cause the arch to slowly or acutely drop (posterior tibial tendon dysfunction). 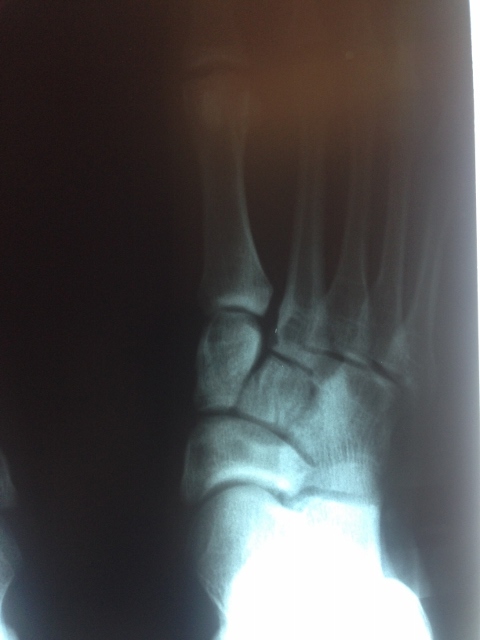 Pain in the arch, feet, ankles and legs aggravated by standing, walking and running. Leg cramps and pain at times during the night. Premature fatigue during activity or simple walking. Weakness in the legs during running. Stiffness and pain in the lower back, especially in the morning. Lack of interest in participating in sports or activities that require running. Flat arch when standing is most common. The arch may look normal off weightbearing. 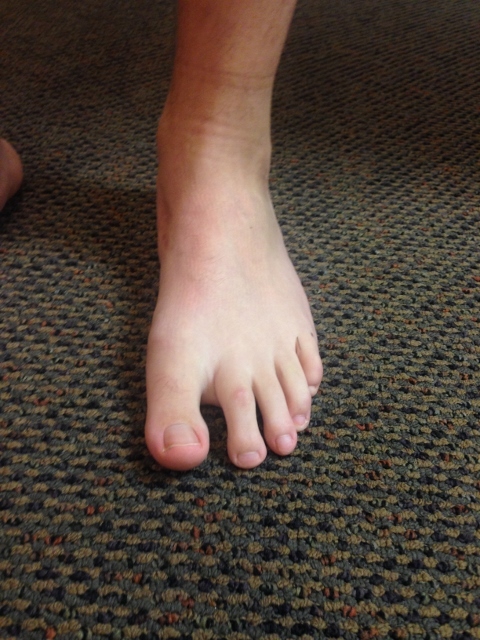 Many arches appear normal when standing but the front part of the foot points out compared to the rearfoot. 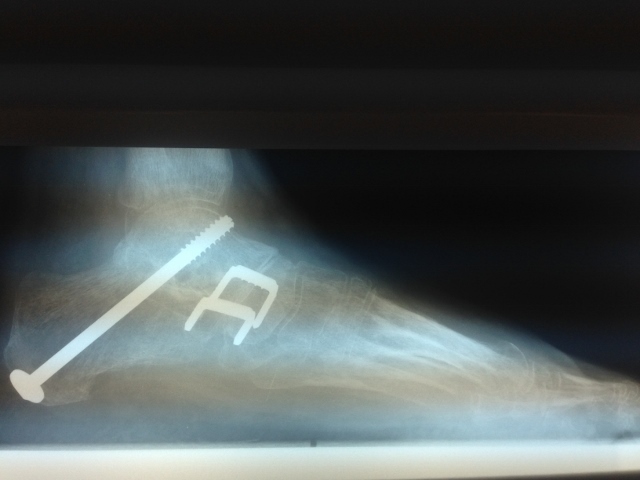 This is a foot that functions like a flat foot and may be a problem. 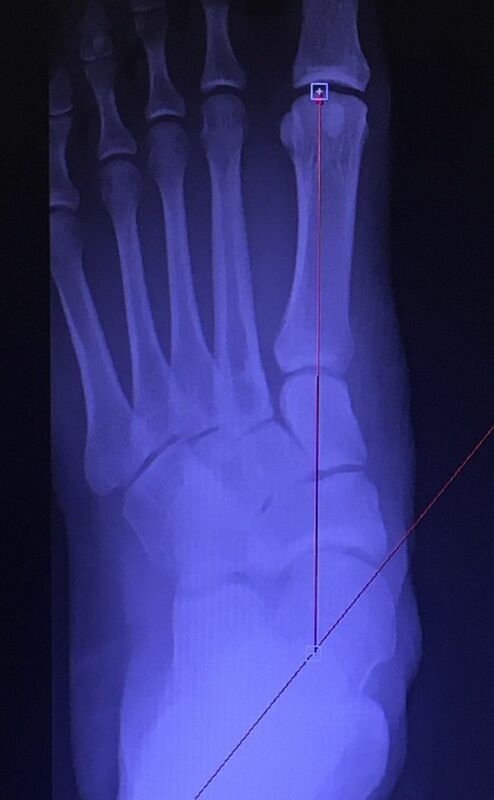 When looking at the feet from behind the heel bone appears to turn out. Feet and ankles look abnormal. 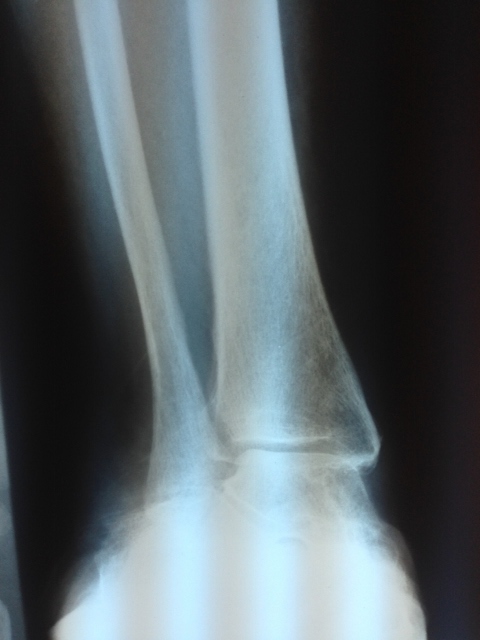 Bulging of the bone on the inside of the ankle and foot. Abnormal gait with the feet excessively turned out. People usually are overweight due to lack of exercise. 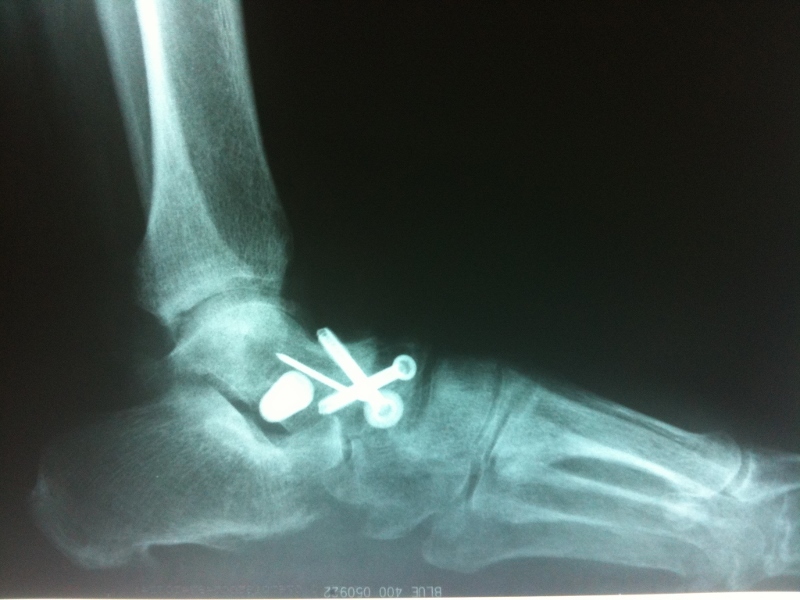 Development of bunions, hammertoes, heel spurs, neuromas and sagging joints. 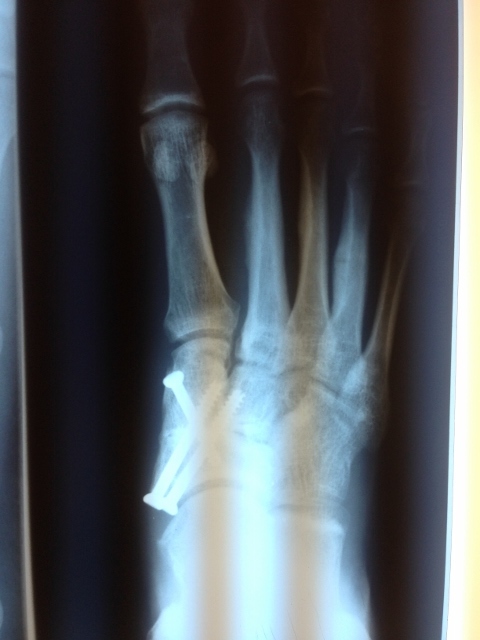 Severe collapse of the foot necessitating reconstructive bone surgery. Limited activity causing weight gain and poor cardiovascular fitness. Muscular tightness in the foot, legs and back. 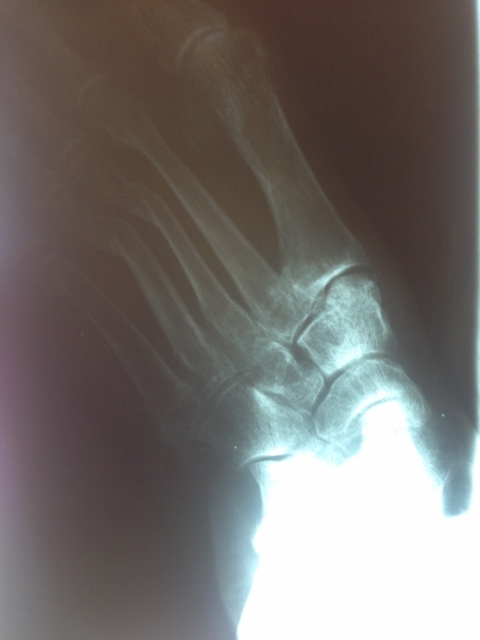 Osteoarthritis in the foot, ankle, knees, hips and back. Back pain, especially in men over 30. History and physical examination to identify areas of pain and underlying causes. Proper shoe gear to support the foot. Orthotics (insoles) custom molded to the foot to support the foot and entire extremity. Physical therapy to strengthen weak muscles and stretch tight muscles. Short period of cast immobilization to stretch excessively tight muscles that may be aggravating the condition. Surgery if all efforts at conservative care have failed to alleviate a person’s problem. Failure to consider a surgical alternative may condemn an adult with severe deformity to continued pain, suffering and poor health. The right foot has an arch and sits in a straight position compared to the left foot that rolls out. From the back, the right heel is sitting straight and parallel to the leg. The Left is everted or rolled out and sits to the outside of the leg. 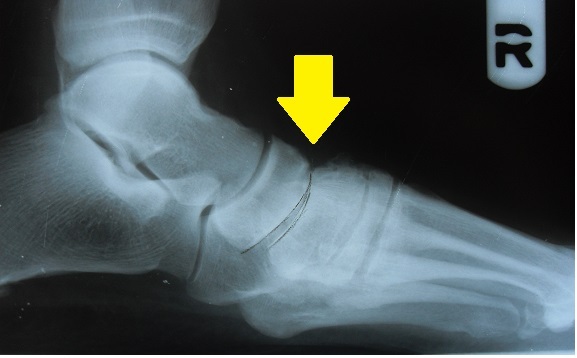 Below is an example of a what is called a midtarsal joint sag which occurs in severe flatfoot conditions, where there is a breach of the Navicular-Cuneiform joint and arch of the foot then collapses much like a failing bridge. 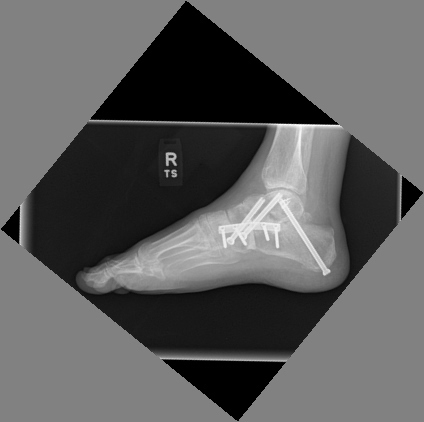 Preop Xrays show the foot from the side and back of the heel. These lines should be parallel and not angled. 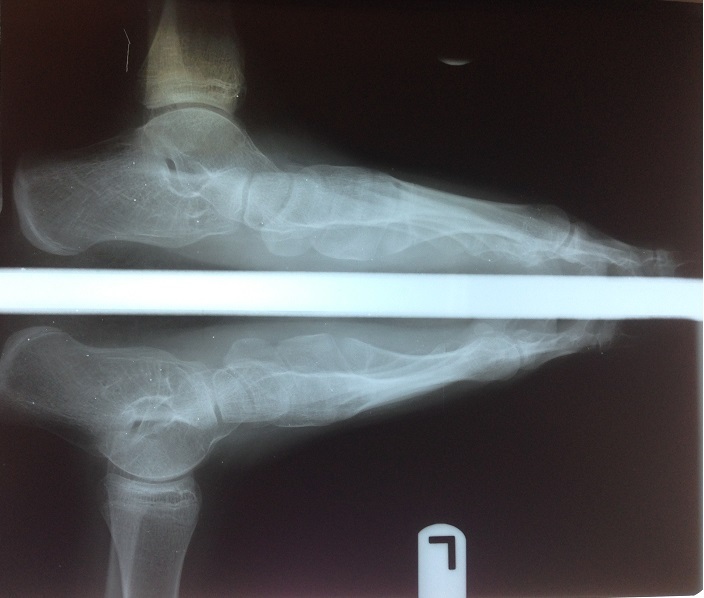 We can see correction of the deformity and excellent alignment after triple arthrodesis. 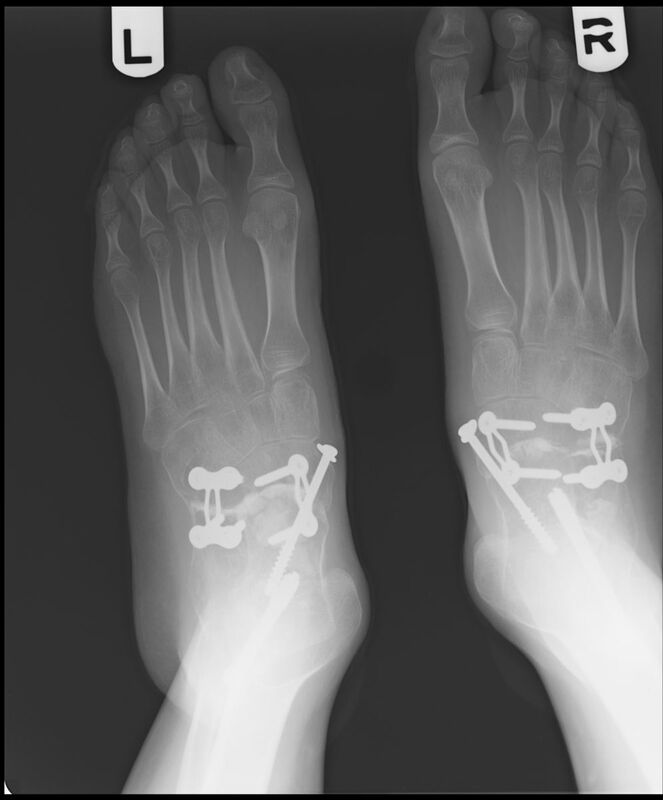 A lateral clinical photo shows the complete collapse of the medial midtarsal joints (left), where the bones that were once suspended are now weight bearing bones (right). 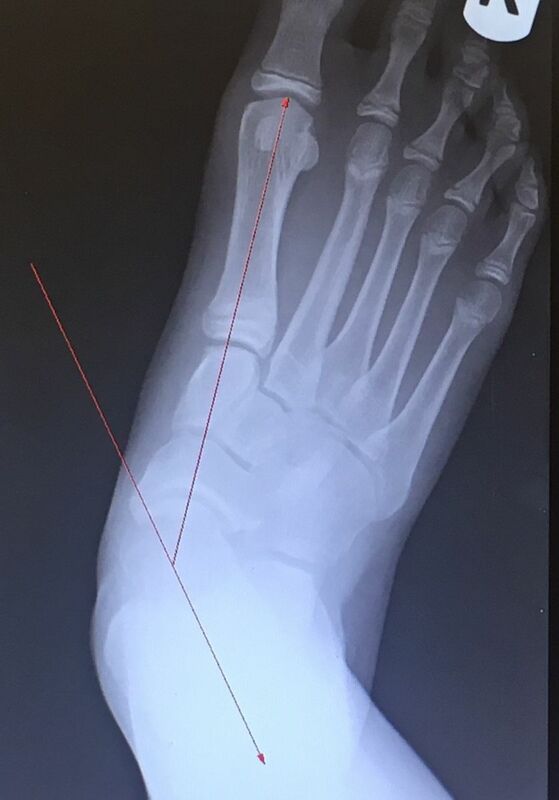 Below is an example of the changes that occur in the ankle from compensating a flatfoot condition in which the ankle goes into a permanent everted position (ankle valgus) which then causes abnormal function of the ankle joint leading to painful and sometimes debilitating arthritis. 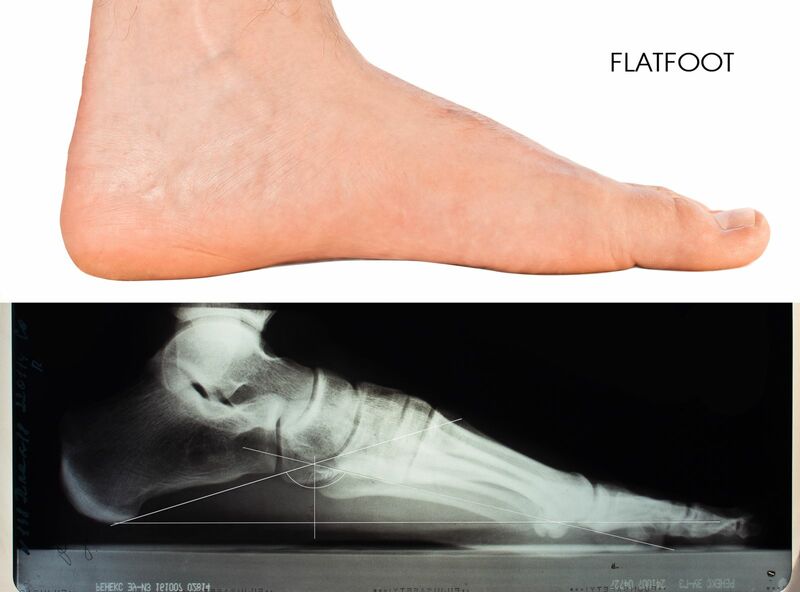 Clinical pictures of adult foot with flatfoot characteristics such as the everted heel bone, and almost absence of the medial arch in both pictures as well as the out-toeing. 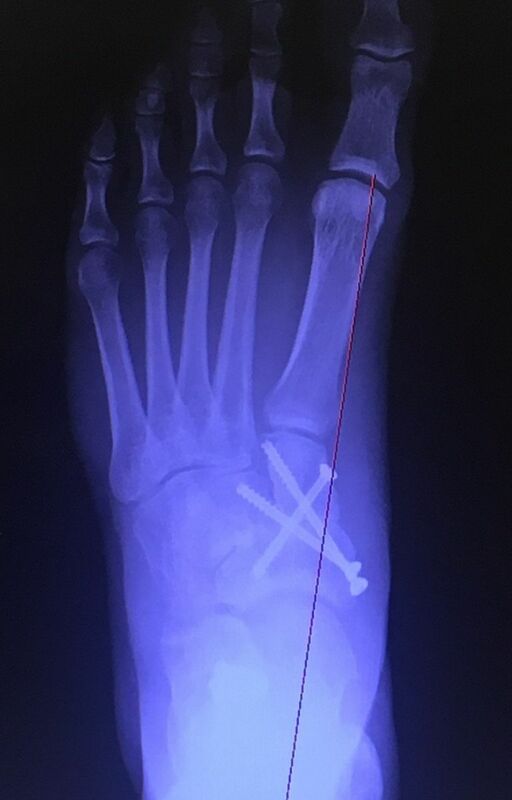 Surgical correction of the flatfoot can involve multiple corrections and techniques. 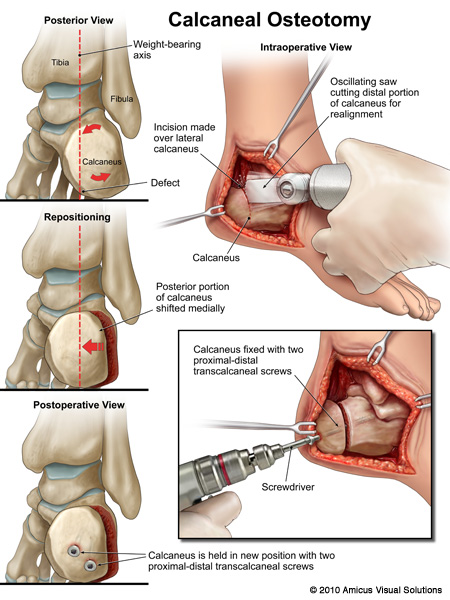 The following is post-surgical correction of the deformity with subtalar joint implant and lengthening of the Achilles tendon. 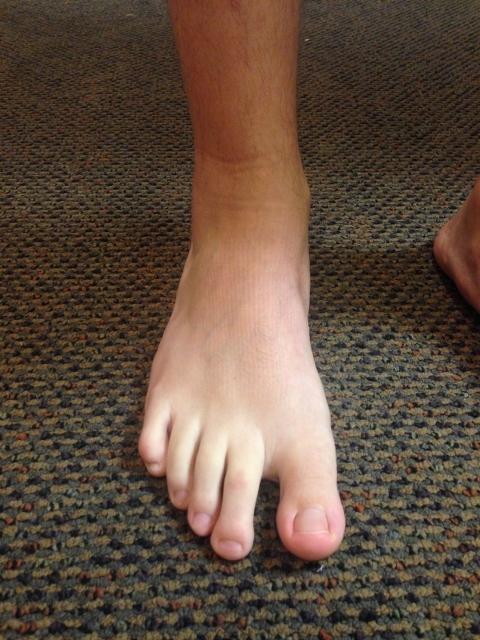 Preop, the front of the foot is completely shifted or abducted on the back. The arch is collapsed and the heel has a low pitch. 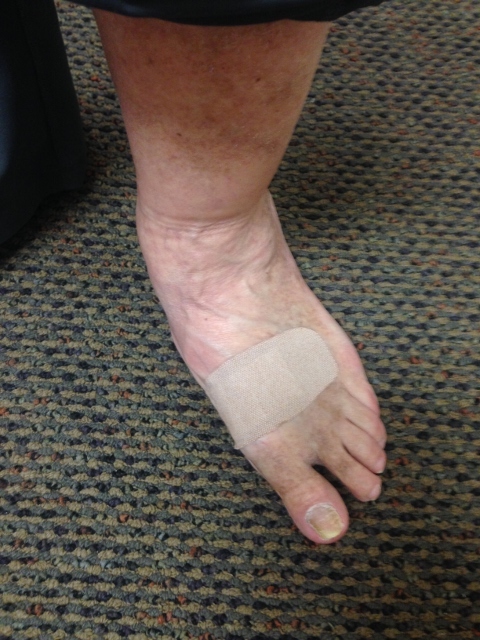 Postop, the foot is aligned and the arch is restored. 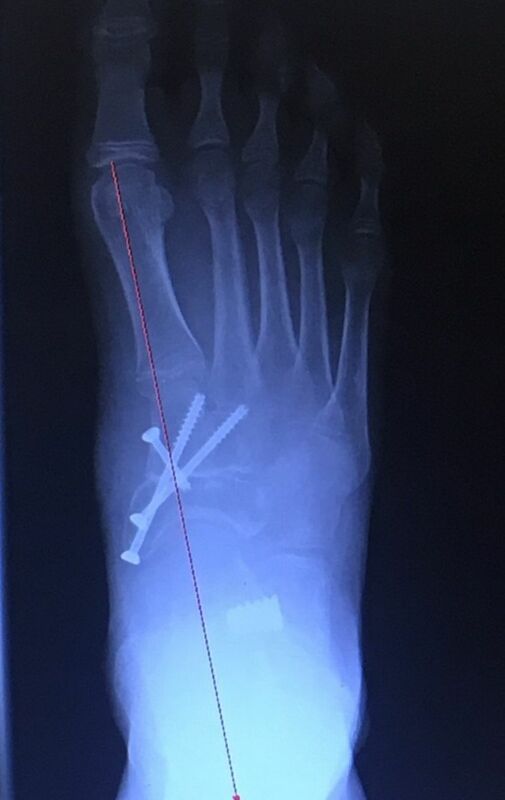 Pics below are of a flatfoot reconstruction after 3 years. 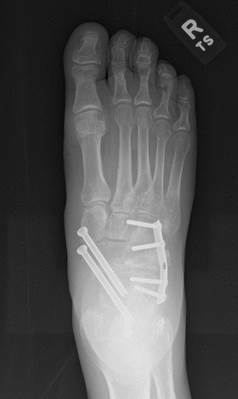 The reconstruction included a gastrocnemius recession, calcaneal osteotomy, subtalar implant and midfoot (navicular-cuneiform) fusion. 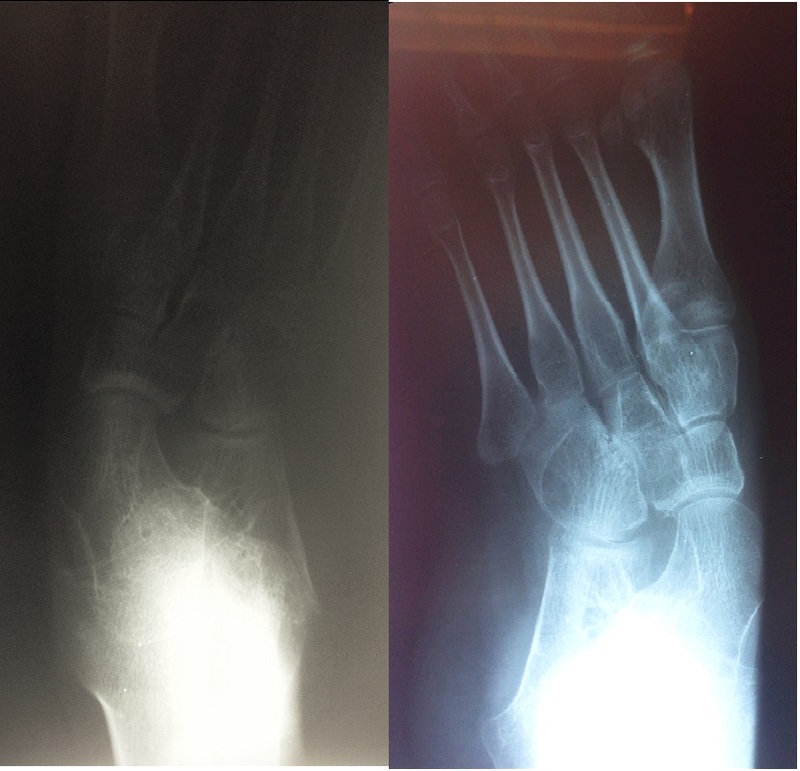 Pics and X-rays of End Stage Adult Acquired Flatfoot after PT rupture 7 years ago. 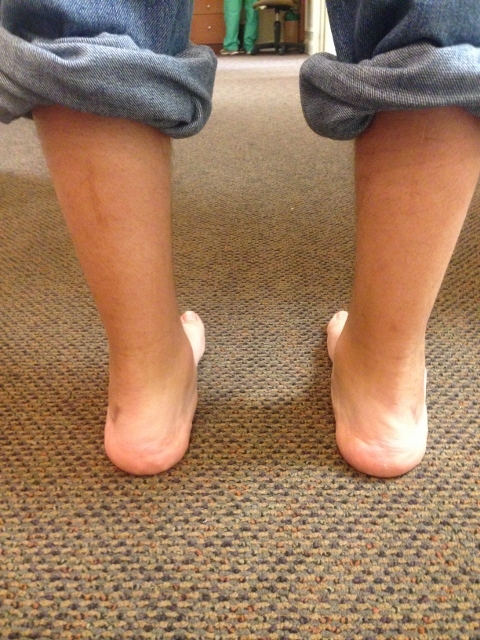 Due to the severity of the foot collapse, the ankle joint is beginning to tilt (ankle valgus). 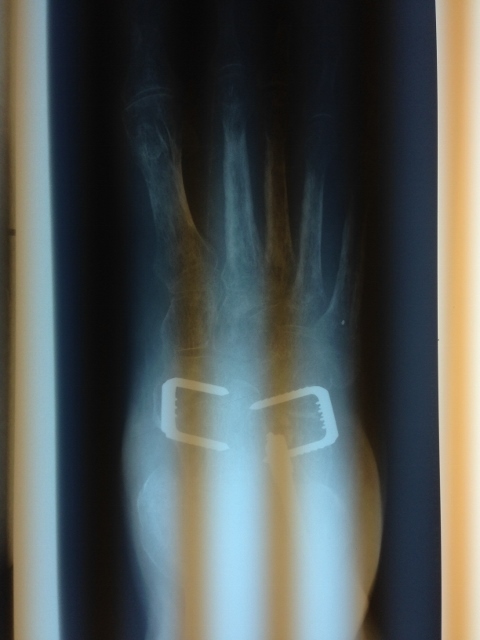 Pic of Pre and Postop X-rays after Triple Arthrodesis for adult flatfoot with subtalar arthitis. 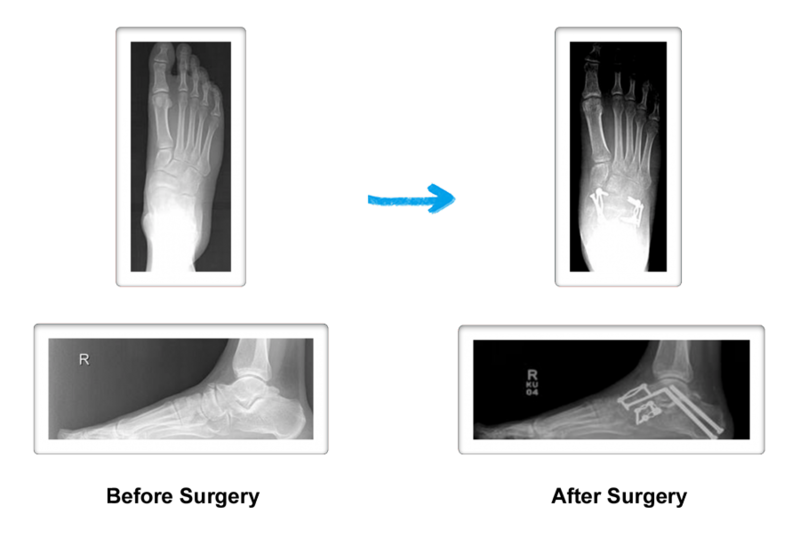 Pictured Below is before and after x-rays of a teenager with a neuromuscular developmental disorder that results in unstable flatfeet. 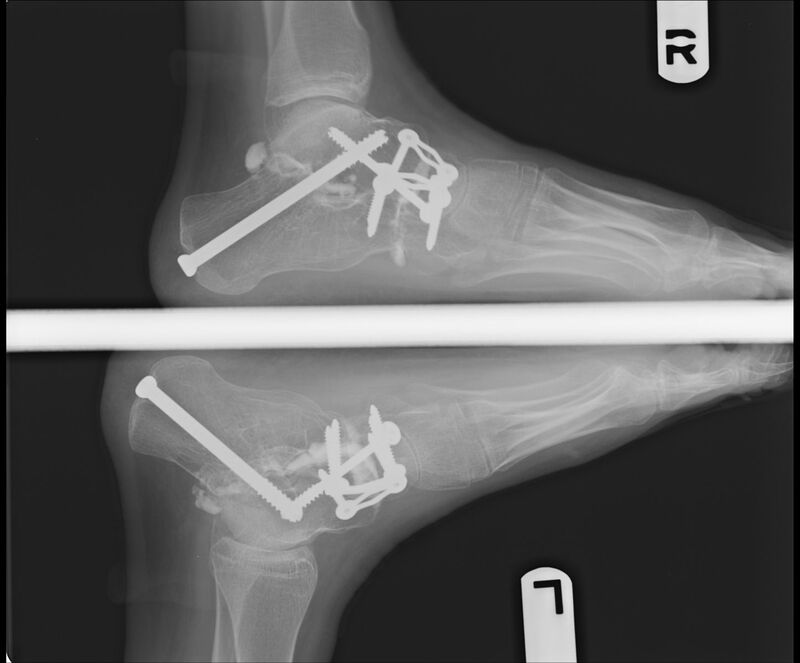 In this case with limited ability to rehab after surgery a more definitive procedure was required involving fusion of three joint in the foot referred to as a triple arthrodesis.